You know you can never go wrong with a Datamancer steampunk laptop. It’s every gamer’s dream unit, and for some the dream is a very enviable reality. Take a look, for example, at this latest version of uber-funky laptops donned in brass and gold. At first glance, it looks more like a very antique, and very expensive, chess box. The big surprise, however, is that what lies inside is in fact the mother of all gaming laptop pearls. It’s a little too showy, but hey, why wouldn’t you want to flaunt something as gorgeous as this? There was an original version back in 2007, but apparently, there’s a newer Datamancer steampunk laptop, obviously because the fans clamouring for more deserve to get a brand new version. The 2012 version looks a lot like that one, but of course, with vast improvements in hardware. Making a return appearance would be the full wood chassis, those fancy lacquered brass keys, and gold foil map for the lead. Giving it an even fancier look are the semi-precious gems that light up as LEDs. And yes, the keyboards are also in brass and gold. Obviously, for all its fancy-looking image, you’ll need it to be more than just an ornament in your bedroom or office. The real question is: does it work? A quick answer is: hell, yes. The very intricate casing still carries an anonymous ASUS gaming laptop, with a 17.3-inch screen (1920×1080), 8GB DDR3 RAM, Intel 17 2670QM processor, a Super-multi DVD drive, and of course, NVIDIA GeForce GT 555M GPU. With these specs, you can heave a sigh of relief, because this Datamancer steampunk laptop definitely is both beauty and brains. Imagine how it’s going to look, sitting ever so grandly on your table. You probably can opt to get the design of the first cover, which had cogs and wheels under a glass covering. Yes, also in brass and gold. Then again, you can probably just worry about the design after you worry about the price. 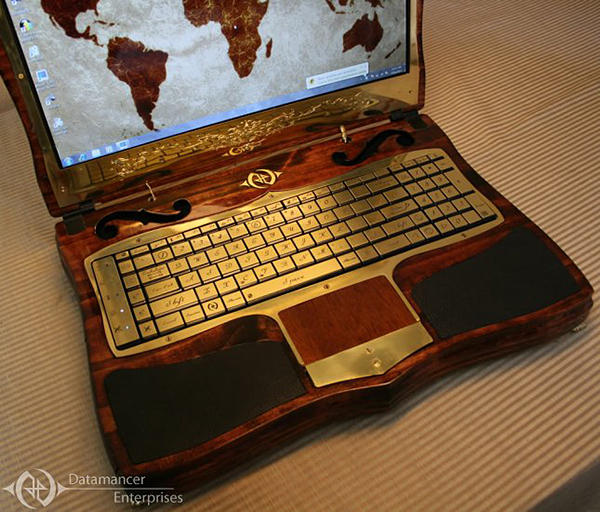 The Datamancer steampunk laptop is said to be retailing at a very painful US$ 6,850. It’s not available yet, but you can bet that more than just a few can-afford loonies will not be hesitating to pick up this work of art. For sure, Datamancer will be laughing all the way to the bank, even with just one of these sold. Hey, for this gorgeous creation, who wouldn’t want to be a can-afford loony, right? This is a guest post by LaptopHQ.org tech blog. Whatever exciting happens in the world of technology – we will write about it! Wow, this machine does look beautiful. But hell, US$ 6,850 is a big chunk of money to spend on it, lol! I have read some just right stuff here. Certainly worth bookmarking for revisiting. I wonder how a lot effort you put to create any such excellent informative website.